The SmartMotor was able to supply the precision motion control with the least amount of electrical noise (electrical noise interferes with ultrasound beam alignment). 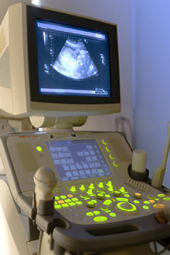 Ultrasound transducers are the wands that send and receive the sound waves, converting the electrical potential energy into mechanical sound wave vibrations and vice versa. 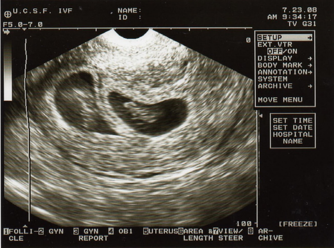 The transducer is the mouth and ears of the ultrasound machine, reading the ultrasound waves through tiny crystals in the end of the transducer which vibrate when voltage is applied to them (the piezoelectric effect). Since many different structures and materials can be imaged using ultrasound, the natural focus of the transducer beam is not enough for adequate imaging. Testing, changing and categorizing the focus of the beam for different structures based on their material and distance from the transducer is essential. While electronic focusing is ultimately controlled by the sonographer, the initial transducer testing is done by the ultrasound machine manufacturer. Manufacturers catalog time and frequency plots for each transducer while beam alignment measurements provide data on the degree of alignment between the sound beam axis and the transducer housing. This kind of information is vital in applications that require a high degree of certainty regarding beam positioning, such as prenatal medical applications. All testing for the multibillion dollar medical manufacturer is done in house, where each transducer is placed in a tank of saline solution and mounted onto a two-axis to five-axis gantry. On the other end of the tank (also immersed in the solution and mounted on a gantry) is a hydrophone: an underwater microphone sensitive to the ultrasonic sound wave spectrum. The testing machine uses high precision ball screw linear actuators driven by SmartMotor integrated servos to control the minute positioning of the transducer and hydrophone, finding the strongest beam path similar to the way you’d locate the most intense portion of the light beam of a flashlight. The SmartMotors are networked over a serial bus to the host PC, which sends different program parameters and movement commands depending on the type of transducer being tested. Many servos could have been used, but the SmartMotor was chosen for this delicate application because of its integrated design and minimization of cabling. "Since almost everything is housed inside the SmartMotor there are significantly less cables, which means reduced electrical noise. Because of the sensitivity of the ultrasound transducer to low voltage signals, even the smallest noise might interfere with the results," said Max Sutlin, Technical Sales Engineer for Minarik Automation & Control. 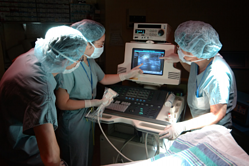 It’s because of SmartMotor’s integrated design and electrical noise attenuation that the ultrasound machine manufacturer has been using it since 1999. And with Class 5’s higher precision, better control and more torque ranges, the SmartMotor will continue to be trusted for ultrasound equipment testing for years to come.